Ganesh (or Ganesha) is one of Hinduism’s most recognized deities and is the remover of obstacles. If ever a time calls for removing obstacles, it’s while traveling. CIRE Travel’s president, Eric Hrubant, takes his Ganesh on every trip and faces it toward the hotel room’s door. 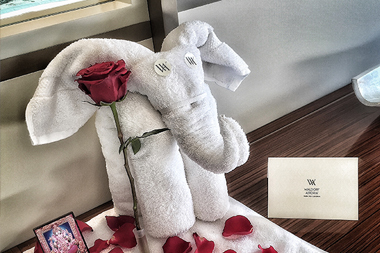 The personal detail that the Waldorf Astoria staff took with creating a shrine for Eric’s Ganesh is just one of many memorable travel moments during his recent trip to Dubai. The distinctive sail-shaped silhouette of Burj Al Arab, a Jumeirah property, is more than just a stunning hotel, it is a symbol of modern Dubai. Yet for all the wonder this stunning structure provides, when you finally see it in person, it is the service within that really makes the Burj Al Arab so extraordinary. Repeatedly voted the world’s most luxurious hotel, this magnificent destination offers the finest service and facilities throughout – right down to the optional chauffeur-driven Rolls-Royce. Burj Al Arab Jumeirah’s suite-only accommodation offers discreet check-in within your rooms, a private reception on every floor and a host of personal butlers, each a warm messenger of our unparalleled hospitality. Even the “Slippery When Wet” signs are gold and full-size Hermes toiletries grace the restrooms. Yes, it is over the top opulence and decadence with the duplexes being suites larger than many peoples home. But if you can swing it, experience it in person, if only for a night, like Eric did. Uber: the helicopter version. UberCHOPPER is available if luxury car service simply won’t do. Boasting an inspirational setting on Dubai’s Palm Jumeirah, with stunning Arabian Gulf views and distinctive external architecture, the palatial Waldorf Astoria Dubai Palm Jumeirah hotel offers a blend of contemporary luxury, exceptional amenities and unparalleled service. Ideally located, this Dubai Palm Jumeirah hotel’s location allows you to experience the tranquility and beauty of the area by day and the contemporary, cosmopolitan glamour of Dubai by night. There is convenient access to shopping, world-class restaurants, chic nightclubs and iconic Dubai attractions, such as the Burj Khalifa and the Walk at Jumeirah Beach Residence. The hotel’s close proximity to major businesses, conference centers and commercial offices make it an ideal base for business guests. A supervised Kids Club and numerous activities are available for the whole family to enjoy. From snorkeling and paddle boarding to wind-sailing and deep-sea fishing, an assigned Personal Concierge will arrange excursions. All 319 spacious and elegantly appointed guest rooms feature views of the Arabian Gulf and beyond to the shoreline of Dubai, contemporary amenities including WiFi and a spacious bathroom, complete with a separate bathtub, a powerful rain shower and luxury amenities. For those seeking additional space and access to the exclusive Club Lounge, palatial suites are available, located on the higher floors of the hotel. Eric can personally attest to the club suite’s ambiance and service. Order the four-course tasting meal. Trust us. Eric states it’s the best pasta he’s ever had thanks to its flavor and texture. 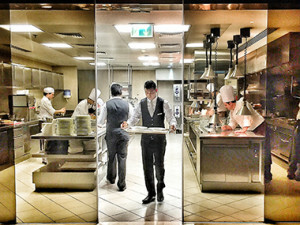 Located in Waldorf Astoria Dubai Palm Jumeirah, Social by Heinz Beck offers a relaxed yet elegant atmosphere with magnificent views of Dubai, making this an ideal setting for every day dining and special celebratory meals. As close to dining under the sea as you can get, the Al Mahara is a seafood restaurant located on the ground floor of the Burj Al Arab. Colorful sea life swim alongside your table in the Al Mahara’s floor to ceiling aquarium. Getting there is fun too. You’ll take a short “submarine” ride. This is a child-friendly atmosphere, much like dining inside of a fish tank. Google Pierchic and one of the first results is “most romantic restaurant in Dubai.” No wonder. Pierchic is a modern, stylish and elegant dining space, which maximizes the views of the Arabian Gulf, the Dubai coastline, Palm Jumeirah and the iconic Burj Al Arab. This high-end Mediterranean seafood restaurant, located at the end of the pier at Al Qasr, Madinat Jumeirah, offers an over-the-water dining experience unmatched anywhere in Dubai. It’s open for lunch and dinner, featuring à la carte menus of classics like oysters, scallops, sashimi and lobster, as well as an array of fresh fish. 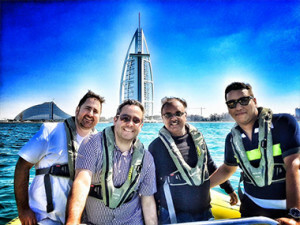 We had the pleasure of a speedboat tour of Dubai and all around Palm Jumeirah, starting in the Dubai Marina and giving us the best views of the city. Thank you to our great partners Eastbound UAE and Kartagener Associates, Inc. for the great ride, including our round trip ground transportation. Ski Dubai is the Middle East’s first indoor ski center located in the Mall of the Emirates. Enjoy skiing, snowboarding or just playing in the snow – whatever your skill level. Choose from five runs, the longest being 400 meters with a 60-meter drop and the most difficult being the world’s first indoor black run. Lessons are available, as well as rental equipment. If the snow sounds great, but you’re not a winter sports fan, watch the King Penguins and Gentoo play in their habitats. The Dubai Mall is a dream come true for shoppers who’ve ever wished all their favorite stores from the U.S., U.K (Fortnum & Mason), France and UAE were all in one place. Rebecca, who visited shortly after Mark and I, found a “mall” to be the last place she wanted to visit. But for me, it was nirvana. Since you’re so close, catch one of Dubai’s most compelling attractions – the Dubai Fountain. Over 6,600 WET Superlights and 25 color projectors create a visual spectrum of over 1,000 different water expressions while 50 color projectors provide a full spectrum of color to Arabic and world music. It’s receiving special attention and insightful insider tips that brings value to having a travel planner on your side when you’re going to Dubai. Think of CIRE Travel as your very own traveling Ganesh, removing obstacles as you travel anywhere in the world. Contact us to plan your trip.